I’m sitting in a spotlessly clean room in a pub in Porthallow, which is an unexpected stop. When I looked at my route for today, my heart sank. Just under 23 miles. What was I thinking when I planned the itinerary? Even on the flat east Coast that distance is a bit too long, and here it is close to impossible. I studied the map and found a couple of short cuts, cutting out some walking inland along one of the rivers, so I decided that if I could lop off 3 or so miles, all might be well. The day started out in light rain again, with all of the path surfaces greasy and slippery, necessitating careful walking. My knee is sporting a bruise in every colour of the rainbow, but I don’t seem to have sustained any real damage. The path was easy to begin with. 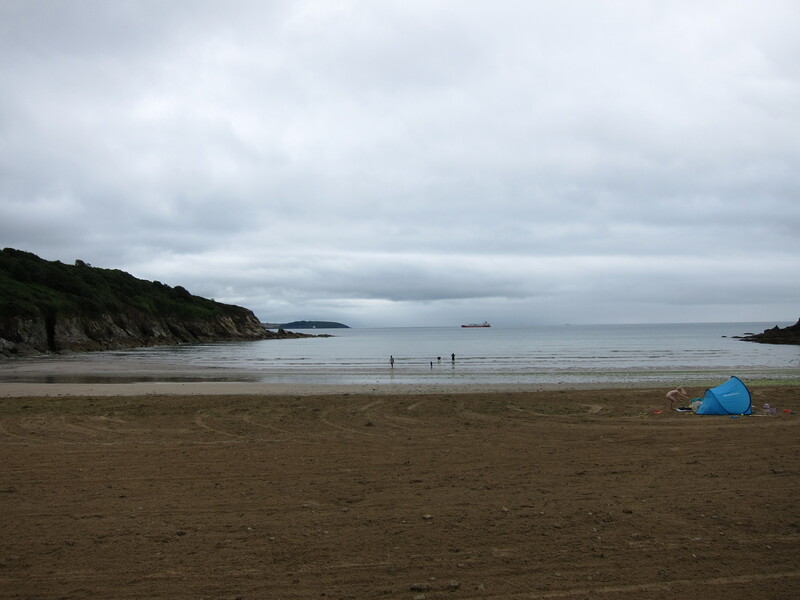 Gentle undulations around to Swanpool, and then Maenporth. I was making good time. Up from the bare 2 miles per hour of the first couple of days to the nearly 2.5, which I needed to cover to have any hope of reaching the YHA at Coverack before dark. As I was deep in these linguistic meditations, I looked ahead and saw a herd of cattle on the horizon. No problem, I thought, having just been through a field where they hadn’t batted an eyelid. This lot looked well away from the path, minding their own business. About 500 yards ahead of me was another walker, with three dogs, two terriers and a Labrador or similar. I hope he puts those on a lead, I thought, or the cattle may start taking an interest. I hope this was not an example of the thoughts creating the reality, because, unfortunately, that is exactly what happened. The cattle, who were young bullocks again, saw the dogs and began to moo and balloo in very threatening tones, setting off the ones in the next field as well. They began to trot towards the path in a very determined fashion. The man with the dogs was fine, he had plenty of time to get through the field before they reached him. I, on the other hand hadn’t. They caught site of me and veered in my direction. Fortunately, I had just come through a gap in the field, with a hedge to one side. I nipped behind it smartly. Once they lose sight of you, they lose interest, I fondly told myself. However they were still mooing and harrumphing, and I did not fancy drawing attention to myself. Depressed, I turned back and took a detour round, which I could have done without as it was on the road, always unpleasant. 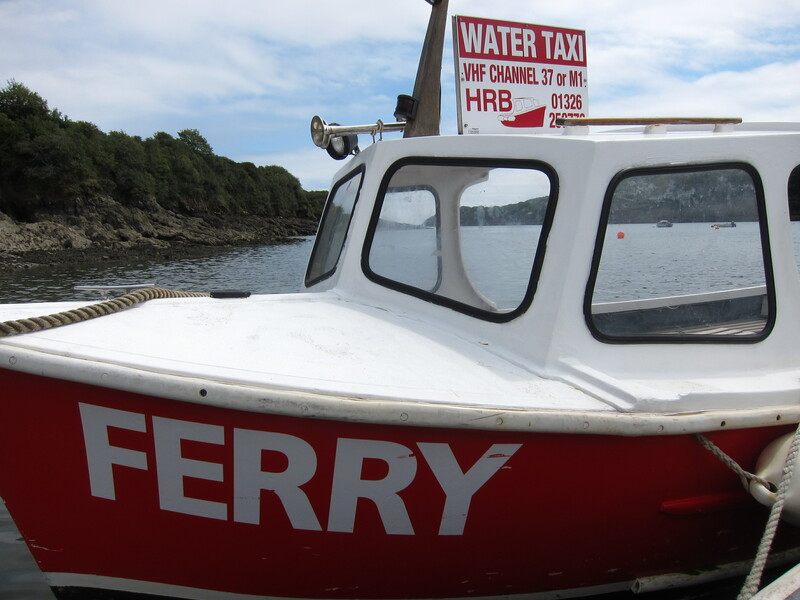 I made good time to the Helford River crossing, arriving just after 12.30 giving me an average of nearly 2.4 miles per hour. As it happened, the tide was so far out that the ferry couldn’t cross before 1pm, so I had a very nice Cornish vanilla ice cream whilst I waited. I was the first one over, as the ferryman would only take one small person to test the water. 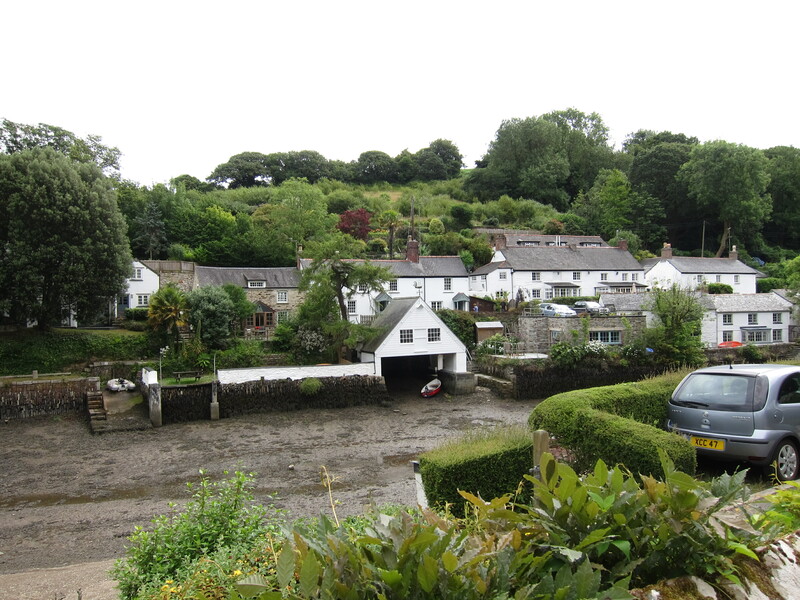 Arriving on the south side, in the pretty village of Helford, I had a choice. 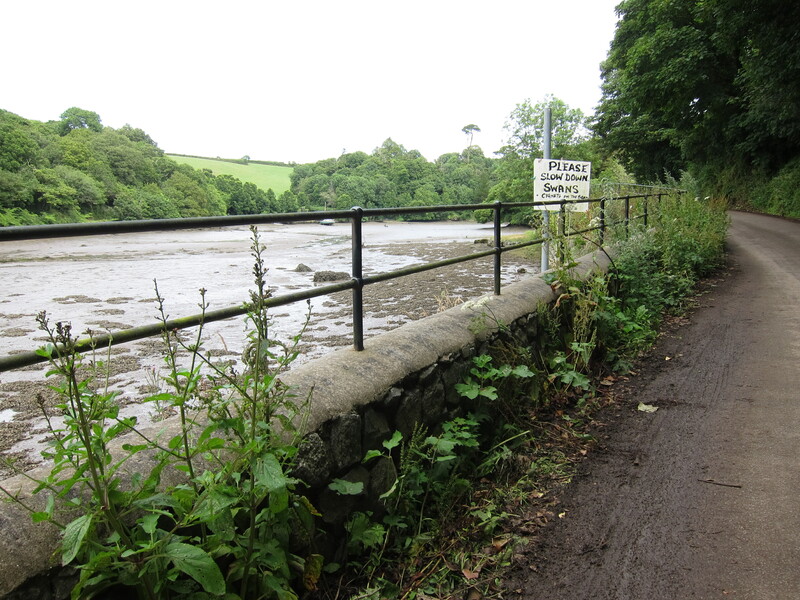 I could walk on the official south west coast path along the banks of the Helford river, then turn inland to cross another stream at the ford if the tide were low, or if it were not, walk at least a mile in either direction along road to the bridge; alternatively, I could assume the ford would be impassable, and strike cross country for the bridge. I decided on the latter. The path was a delightful woodland saunter , at one point along a road where there signs advising drivers to beware of swans crossing! The rain had finally cleared, and it was brightening up, although very humid. I consulted my map again. Coverack still looked very far away. I made the decision to see if I could find accommodation in Porthallow. If I could, I would stay there. I arrived there around 3, having covered 12.7 miles. Sitting in front of the pub (Dewotty Pymp Heren) or the Five Pilchards in English, was a row of hikers hugging beers. They informed me that the landlord had just closed for the afternoon. I really didn’t fancy another five miles to Coverack. Happily, there was a number on the front door for anyone looking for accommodation, so I called up, and the landlord returned to let me in. So here I am. I have spent some time working out how I can change the next few days. I really can’t do the distances I planned over this terrain. I’ll aim for the Lizard lighthouse tomorrow – around 15 miles. This entry was posted in Cornwall and tagged Dewotty Pymp Heren, Swans. Bookmark the permalink.